In February, the United Nations treated 500 delegates at its Environment Programme event in Kenya to a five-course meal. The surprising thing about this is that all the food served would have been rejected by European supermarkets despite being perfectly fit to eat. Waste food is an important issue for people interested in food provisioning. Waste food represents wasted resources of water, energy and land and so has an environmental impact in addition to representing economic loss for farmers, retailers and consumers alike. Interest in food waste has been increasing recently. Kerry McCarthy MP proposed a Ten Minute Rule Bill to the House of Commons which sought to require supermarkets to donate their surplus food to charities rather than throw it away. There have also been reports on food waste by the Institution of Mechanical Engineers (IME) and the Fabian Society. Reducing food waste seems to be a sensible thing to do for consumers in a time of austerity and, at a policy level, to reduce the environmental impact of agriculture. However, there are problems. A major difficulty is trying to establish how much food is being wasted. The IME report says that between ’30-50% of all food produced never reaches a human stomach’. In addition to being a large, imprecise range, some of the data are quite old, and, as suggested in this BBC radio programme, inaccurate. This 2010 paper reviews definitions and data on food waste and suggests that post harvest losses of grain in developing countries might be overestimated. Another problem is working out quite what we mean by ‘waste food.’ These debates can include discussion of just what is waste and, as discussed by Professor Strak here, economic arguments about the opportunity cost of turning useable produce into food mean that not all unused food should be considered waste. At a domestic or business scale, working out food waste might be a little easier and there have been several studies attempting to estimate the quantity of waste food. This study, by the Sustainable Restaurant Association found that, on average, the ten London restaurants it surveyed wasted 59.8kg of food each day which is 21 tonnes of food waste per restaurant per year. In addition to the economic cost to the restaurant, these figures also contribute 7.972 tonnes CO2 equivalent per restaurant in Greenhouse Gas Emissions where waste food is sent to landfill. There have also been studies into household generation of food waste. This study, carried out by Waste and Resources Action Programme (WRAP), a not for profit company including business and government stakeholders, found that, on average, a household produces 5.3kg of food waste per week, costing £520 per year to the household. 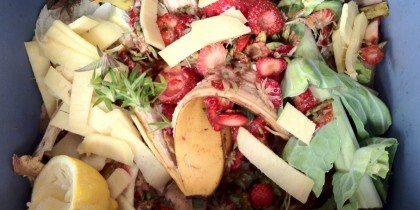 Of this food waste, the study estimates that nearly 70% of it could have been avoided. Reducing waste food has a common sense appeal. It saves money and reduces the environmental cost of agriculture. However, as shown above, calculating food waste is difficult. Also difficult is knowing what to do to produce a reduction in waste. Cutting portion sizes, improving labelling of foods, accepting ‘ugly’ fruit and vegetables have all, inter alia, been proposed as ideas to reduce food waste in developed economies. The effects of offering food advice, or using ‘nudges’ can also be difficult to predict and can lead to political controversy. The Fabian research found that waste reduction measures requiring little change in individual behaviour were most popular with consumers. Government advice on diet is given greater prominence, reflecting developed world concerns about obesity and diet related illness, rather than waste reduction measures. Faced with a lack of certainty and a potential loss of votes, government focus on food provisioning in countries like the UK tends to be on production which is easier to measure and predict. Production also contributes to economic growth and provides commercial opportunities. Whether that is a sustainable policy position in the longer term, remains to be seen. Dr. Adam Spencer, Schools of Geography and Sociology, University of Nottingham.